« The Golf Blog: Does USGA proposed ban on anchored belly putting help Tiger Woods’ quest to beat Nicklaus’ record? The Golf Blog says: World No. 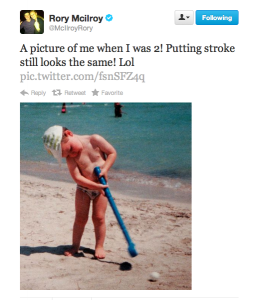 1 golfer Rory McIlroy tweeted his view on the USGA and R&A recent proposed rule to ban belly and long putters anchored during a putt. The young Rory tweeted a photo of himself as a young baby using a belly putter. But that’s the last time he said he would use one!